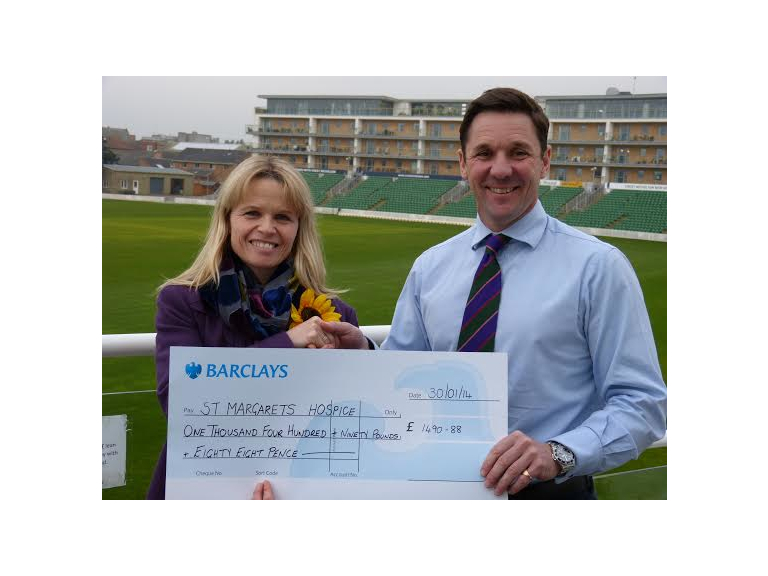 Somerset County Cricket Club recently handed over a cheque for nearly £1500 to St Margaretâs Hospice. The money was raised by The Club at our 2013 Christmas Party Nights thanks to a novelty race event which took place each evening. Catering General Manager Samantha Safe explains: We wanted to do something different for our Christmas Party Nights last year and we also wanted to raise some money for charity. I came up with the idea of Pig Racing a few years ago when I was working in the hotel trade and was looking for an entertaining way to raise money for a good cause. As it was Christmas we wanted some walking toys that were Christmas themed but after looking on line we couldnt find any so we decided to go for walking pigs again!Every night we asked each table if they would like to buy a pig for the evening. After all the tables had chosen their pigs, we switched them on, lined them up and watched them go! The winner was the first pig to make it across the dance floor and the winning table got a bottle of bubbly We were a bit nervous about whether it would take off but as you can see from the money that was raised it was a fantastic success!